Addressing Congress, Trump stood by his plan to subject travellers from certain countries deemed a risk to extreme vetting, insisting, We cannot allow a beachhead of terrorism to form inside America. WASHINGTON: President Donald Trump suggested a new merit-based system to regulate entry to the United States on Tuesday, as he tried to square his hardline campaign rhetoric with the goal of broad immigration reform. Addressing Congress, Trump stood by his plan to subject travellers from certain countries deemed a risk to extreme vetting, insisting: "We cannot allow a beachhead of terrorism to form inside America." But -- alongside this promise of "strong measures to protect our nation from radical Islamic terrorism" -- he held out the prospect of a merit-based immigration system that might win cross-party support. 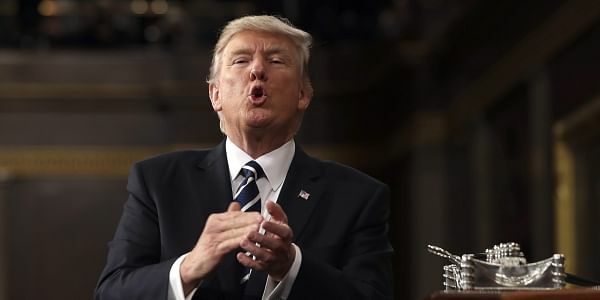 Arguing that mass immigration by unskilled workers costs the US taxpayer billions of dollars and depresses the wages and job opportunities of the working poor, Trump urged lawmakers to get behind reform. "If we are guided by the well-being of American citizens then I believe Republicans and Democrats can work together to achieve an outcome that has eluded our country for decades," he argued. A merit-based system -- such as those in use in Canada and Australia -- would, he argued "save countless dollars, raise workers' wages, and help struggling families -- including immigrant families -- enter the middle class." "It is a basic principle that those seeking to enter a country ought to be able to support themselves financially," Trump told lawmakers. "Yet, in America, we do not enforce this rule, straining the very public resources that our poorest citizens rely upon," he added. US lawmakers, encouraged by the previous administration under president Barack Obama, have long sought to agree a broad-based package to provide roughly 11 million undocumented migrants with a path to legal residency. But Republican members, in particular, faced opposition from their electoral base to any measure that smacked of an "amnesty" for illegal immigrants -- a sentiment that Trump played up to during his campaign. Vowing to build a wall on the Mexican border to keep out migrants he branded drug-dealers, murderers and rapists, Trump gave every appearance of planning a still tougher line on immigration. But his attempts to introduce a visa ban on visitors from seven mainly-Muslim countries deemed seedbeds of terror have been halted by the courts, and he faces opposition from influential quarters to tougher general controls. Silicon Valley software giants, with their huge lobbying reach, rely on recruiting foreign engineers -- particularly from the Indian sub-continent -- and Republican backers in construction and agriculture employ millions of migrants. Federal officers from Immigration and Customs Enforcement and from Customs and Border Protection have set about enforcing existing immigration law with renewed vigor -- but their dragnet has triggered popular protests. Earlier Tuesday, Trump suggested in a meeting with television news anchors that he was open to a deal that would legalize millions of undocumented immigrants as part of a bipartisan compromise. That would mark a dramatic shift in policy. "The time is right for an immigration bill as long as there is compromise on both sides," Trump reportedly told the anchors. But there is clearly a line that Trump cannot cross if he is to placate his electoral base. Blue-collar crowds in the key states that gave him victory cheered his "Build the Wall" mantra to the rafters. And Trump has firmly tied his pledge to fight illegal immigration to the prospect of jobs and security at home. "By finally enforcing our immigration laws, we will raise wages, help the unemployed, save billions and billions of dollars and make our communities safer for everyone," he said. He said he had given orders to create a special office to assist victims of crime by immigrants: "VOICE" -- Victims of Immigration Crime Engagement. He then paid tribute to four guests in the audience, who, he said, had lost loved ones in violent crimes committed by immigrants living in the country illegally.